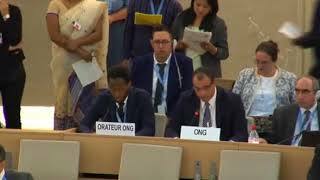 EAFORD and Geneva International Centre for Justice are seriously alarmed by the humanitarian deterioration in Myanmar since its last UPR review in 2015. Security operations in Rakhine state may amount to crimes against humanity. During the UPR, Myanmar was repeatedly recommended “to take urgent steps to address escalating extremist nationalist sentiment in the country”. Contrary to that, the past two years were marked with a frightening rise in religious intolerance, especially anti-Muslim sentiment. Incidents of hate speech, incitement to hatred and violence and religious intolerance are highly concerning. Today, the Rohingya of Rakhine State are facing atrocious acts amounting to genocide. Contrary to appeals by Member States during its last UPR, Israel continues to violate Palestinians’ right to life and security of person, particularly through hate speech, incitement to violence and excessive force, and the failure to hold perpetrators accountable. Violence against Palestinians by extremist Israelis is flourishing and is not merely a consequence of rampant racism but also a form of exerting control – one that is facilitated by the disparate legal systems endowing perpetrators with legal protection. Adherents of the extreme right feel emboldened by inflammatory speech by state authorities and guaranteed impunity. The Myanmar and Israeli governments must take urgent measures to end extremist violence and ensure the protection of all people under effective state control and must fully cooperate with UN agencies.